The aromas of cooking infiltrate every corner of the small apartment. Aracely Rojas carries plate after plate to the kitchen table: pozole with hominy, tamales, garlic prawns, lamb barbacoa, ceviche Veracruz, Yucatan pork with plantains. Her guest, Prasad Chirnomula, is dazzled: “I love your food,” he declares. She sparkles. 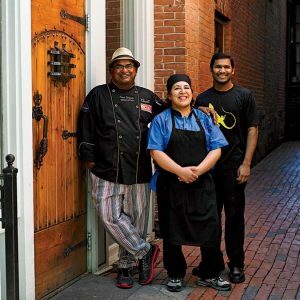 It’s an unlikely scene on this December night in 2010: a Mexican home cook making dinner for an Indian chef in a small apartment in New Haven, Connecticut. But this meal is more than a dinner party; it’s a job interview, and the continuation of a deeply rooted tradition for Chef Chirnomula: cele­brating the work of exceptional home cooks in his professional kitchen.